Background and Objective: Li3InBr6-yXy (X=F, I) was synthesized and the substitution effect on ionic conductivity was investigated. Method: An all solid state secondary battery was fabricated using Li3InBr6-yXy (X=F, Cl, I) and evaluated. Li3InBr6-yFy was single phase at y ≤ 3. The lattice constants for both compounds were decreased with an amount of F. The conductivity of Li3InBr6-yFy was decreased with y and electrochemical stability was improved by the substitution. 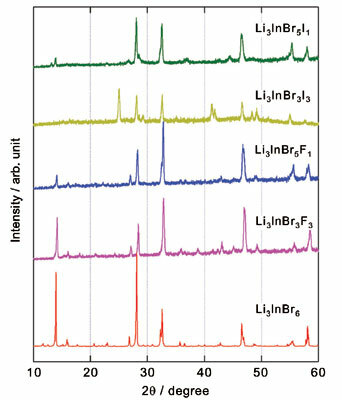 The conductivity in Li3InBr6-yIy(y ≤ 3) was changed with y and Li3InBr3I3 showed the highest value in these compounds to be 3 ×10-3 Scm-1 at 333 K. 7Li NMR spectra in Li3InBr6-yIy was sharp and it was confirmed the diffusion of Li ion was fast at room temperature. Batteries using Li3InBr5F could be stably charged and discharged for 10 cycles. Results and Conclusion: The discharge capacity increased in the first few cycles and the maximum value of 81 mAhg-1 was obtained in the fourth cycle. Solid electrolyte, ionic conductivity, Li-ion secondary battery, all solid-state battery, substitution effect, phase transition.